The vole: The small, mouse like rodents spend most of their time in their burrow system below ground, but they do spend time aboveground and sometimes be seen running about. The clear sign that you are being visited by a vole is the presence of well-traveled aboveground runways that connect burrow openings, which can be about 1½ to 2 inches in diameter. A protective layer of grass or other groundcover usually hides the runways. 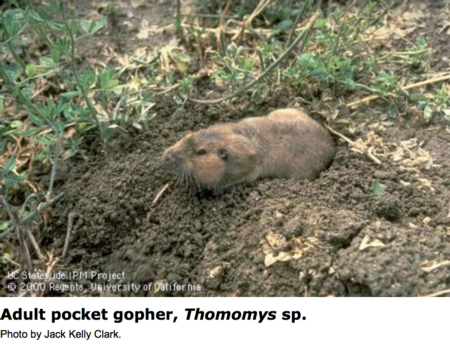 Ridding your garden of gophers completely is a virtually impossible task. The most surefire way to protect the roots of vulnerable plants is by placing sturdy chicken wire between your plants and the gopher.